The efficiency and energy savings of public lighting are currently very hardly debated subjects and the general understanding supported by the lighting design practice agree that there is more to street lighting than percentage, figures, charts, calculations and statistics alone. The nighttime public lighting is a more complex argument: an increasing numbers of papers and essays address several points such as the aesthetical, psychological, social and economical benefits of lighting in urban social life. More than this, the city night lighting is strongly interested on a sustainable approach that is linked to the impact of using too much electricity and light with its devastating effects in energy consumption but also from a biological and naturalistic point of view. The traditional simplifying idea on sustainable street lighting is based on a double rational approach: economical and environmental/technical, so as to say that laws, lighting normatives, public administration and most of the lighting companies are focused on energy-saving public fixtures. The efficiency of street lighting is determined by the selection of the most suitable light source in combination with the appropriate fitting and the selection of the technology, the management and maintenance that contribute to the life span and the performance of the entire system. However it is well-known that for a rational energy consumption and energetic sustainability every situation asks for a specific approach.As an example and despite of the general trust of technology and innovation, if every single component is put in the count of the sustainability of a street lighting, in comparison with other light sources, LED lighting does not necessarily constitute the most efficient light source. It is basically because it is not yet enough performant to take on all lighting functions. It will, in the future, evolve with all the potential dynamic and pleasurable applications. More than this the contemporary practise of over-lighting, that cause pollution and completely endanger the darkness, cannot be solved by using a more efficient technology: new strategies in completely new directions has to be conceived and planned in order to achieve a better ecologically responsible lighting design of the streets at night using less light or in a more creative and intelligent ways coping with the surrounding surfaces and the materials of the city. So imagine a city that can react to natural and artificial light, in a passive or active way generating a more luminous scenario in a sustainable and 0 energy way. These scenario recalls the idea of energy as a very important and limited resource and the idea of off-grid solutions to save and better manage it. Several materials can be added to the surfaces of the city such as the streets, sidewalks, walls, facades, galleries in order to diffuse, differentiate, direct, reflect, refract, diffuse and increase the traditional amount of lighting. Their use in the cityscape can contribute, with the same amount of light, for a better visibility, a more interesting scenario, a better orientation and perception of distances and spaces but also can redesign the image of the city in a more interesting and various way. As previously mentioned in the post “Urban darkness: turning off light for more animated and human-scale strategies of lighting” , cities and outdoor common spaces can be lit with low energy efforts by readapting antique techniques inspired by traditional uses thanks to low and high-technological materials. In the followings, I will speak deeper abut these arguments, focusing on some examples of reflective metal application, retroreflective techniques, photoluminescent pigments and applications that can lit the city in a morerticulated and humna-scale way. As an example the ancient golden ornate known as gilt, the decorative techniques of applying fine gold leaf or powder to solid surfaces such as wood, stone, or metal to give a thin coating of gold was also a method for increase the illumination of a room through the reflection of the source of lighting as candlelight.The same effect of the gilding can be applied on some particular walls of the city, in special corners and edges in order to evidentiate details, dangerous entrances and crosswalks where passersby need to be seen, or in a very elegant and aesthetic but effective way in the downtown and beatufiful citycenters. This idea do not require highly costly materials and of course not the use of gold. It is a 25-foot tall by 110-foot long, wind-activated artwork that consists of 3960, 9”x 9” squares of aluminum chainmail. These hanging panels of metallic fabric are extremely lightweight and responsive to subtle changes in the wind. The kinetic facade extends inside the building and covers a floor to ceiling wall inside the lobby where it is animated by the ventilation system of the building. A series of 7, 30’ tall, aluminum and stainless structures that turn in the wind and serve as a symbolic hinge between the Milwaukee Art Museum and the new Discovery World / Pier Wisconsin complex. The surfaces of the sculptures are covered by thousands of small stainless steel disks that ripple in the wind. Ball bearings in the support columns allow the sculptures to rotate and reveal the direction of the wind. Hand wheels on the support columns also let viewers turn the the sculptures and interact with the artwork. The columns are surrounded by a series of benches that can be played like a xylophone and a musical instrument that is played by dropping pebbles through a matrix of stainless steel nails. A second wind-animated shade screen for the arts center is composed of thousands of blue-anodized, 3 inch square, aluminum flaps that move in the wind and create the illusion that the building has been submerged in a vertical sheet of rippling blue water. As the blue- anodized flaps pivot in and out with the passing breezes they reflect different amounts of light from the sky, changing from deep blues when they are angled down to bright, light-blue glints when they catch the sun, with countless subtle shades of blue in between. The result is a blue-tinted, animation of the ever-changing patterns of the wind. A collaboration with BOORA and DWL Architects and the engineering firm Paragon. In 2002, Ned Kahn worked with the staff of Technorama, the major science center in Switzerland, and their architects, Durig and Rami, to create a facade for the building which is composed of thousands of aluminum panels that move in the air currents and reveal the complex patterns of turbulence in the wind. The facade is visible from the large urban plaza in front of the museum. Another artist that is working brilliantly with sequin and the street art is Theresa Himmer (www.theresahimmer.com) who has set up interesting dazzling pieces of street art in Iceland using oversized sparkles and creating nature-specific themes (such as mountains and waterfalls) with obviously manmade materials that can react to the wind and weather, but above all with lighting both natural and artificial. The result is a complete transformation of how we see urban life. The semantic approach of the artist is reproducing a hyper commercial product from the world of advertising and display in another contest, the city, with the aim of catching the passersby’s eye with the constant movement and flickering light of the sequins. 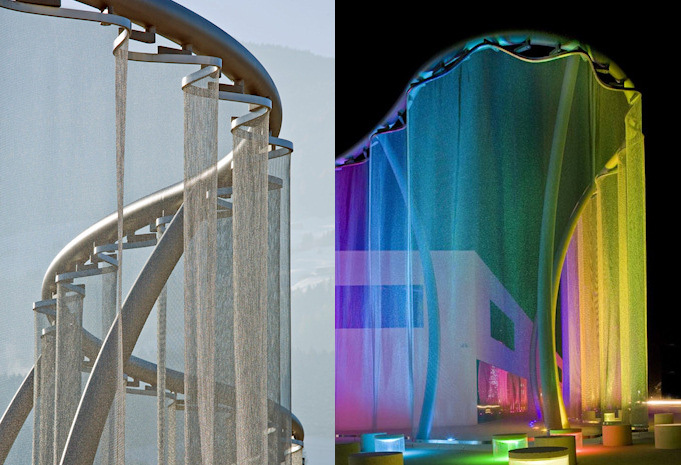 Suitable for applications in architecture, interior architecture and design, Alphamesh ring mesh is a creative new material made of transparent formative rings whose applications are related from façade elements to store construction, to street curtain creation and reflective surfaces shaped as urban furniture. Alphamesh is for indoors and outdoors applications. 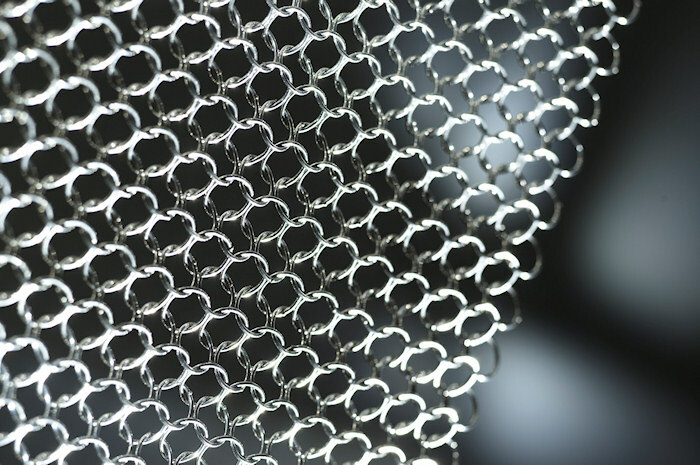 The rings are combined to form a mesh with a unique radiance: the multiform mesh particularly attracts attention in 3D structures because in the third dimension, technical precision combines with organic forms in room-shaping applications. Alphamesh can be twisted, bent, elongated, tensioned, braced or suspended. The combination of Alphamesh in transparent ring structure depicts motion pictures and silhouettes with a distinct dynamic. This is intensified through the reflections in the polished surface of every single metal ring, which gives the overall image a special sheen. The rings are made of stainless steel, bronze or a combination of stainless steel and bronze, the so-called ‘bicolor’, and in two ring diameters. 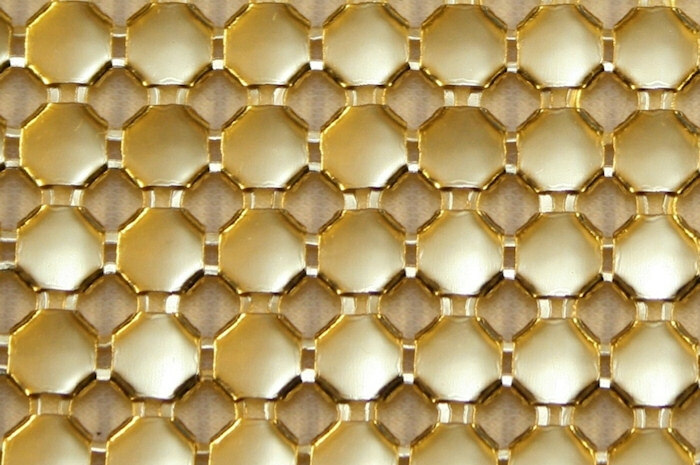 The Alphamesh scale mesh is available in two different materials: brass or aluminum. In a technical sense, Alphamesh presents a relatively slight weight, which with a ring diameter of 12 mm in the stainless steel version is not more than 3.2 kilograms per square metre. 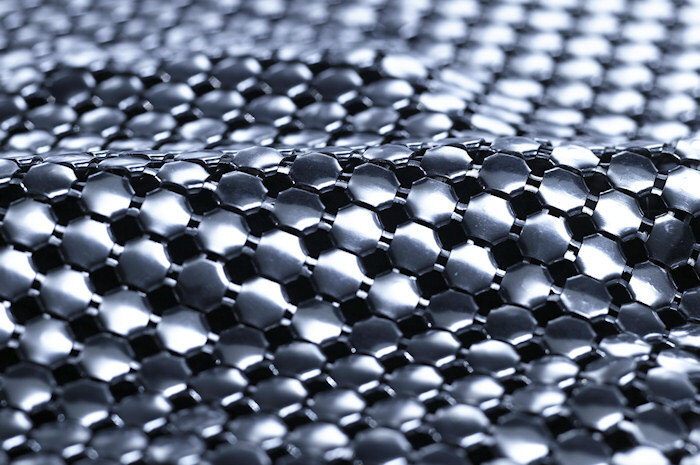 The manufacturing process employed for alphamesh makes it possible to manufacture fabric from ring mesh in optional dimensions. Moreover, the company’s vertical range of manufacture allows the development and production of customer-specific ring meshes. At the same time, dimensions and individual fabrications are always linked to the constructional and structural-physical conditions of the planned structure. 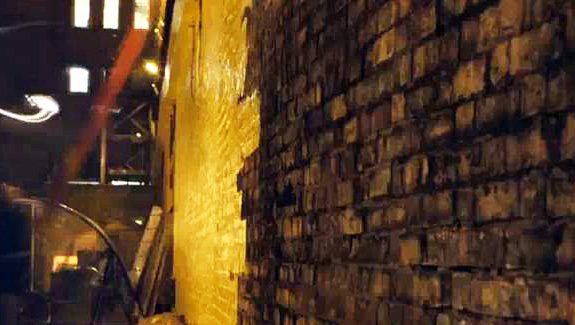 The reflection of the metal constantly creates new effects, while at night a light display is created by the use of special lighting equipment. 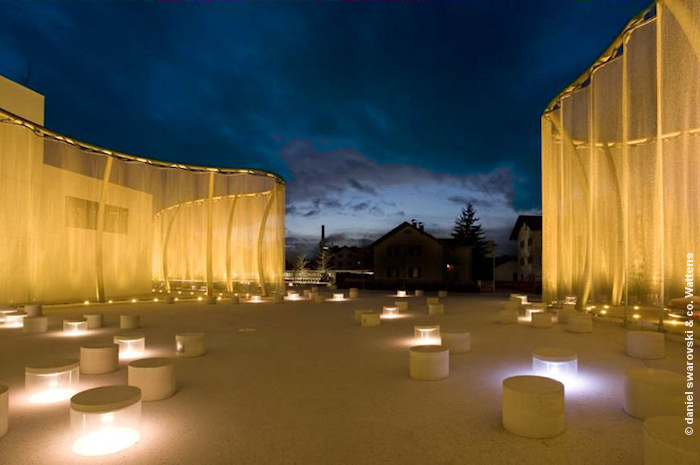 An impressive installation with Alphamesh metal fabric has been created for Swarovski & co. in Wattens: the purpose was to achieve a metal curtain with its optical and textile properties in an exterior area. Alphamesh scale mesh defines a new quality of material for metal meshes utilized in architecture and design. 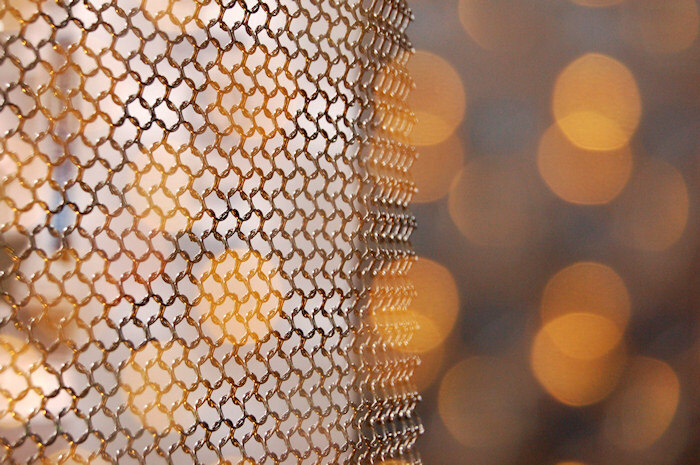 The flexible mesh resolved the heaviness and coldness of conventional metallic surfaces. Light forms and exclusive structures in elegant radiance suggest the association with sequins of ornate clothing. And many fashion designers have already discovered alphamesh scale mesh for their collections. Alphamesh scale mesh is available for architects, interior designers and designers in two different material versions, brass or aluminium. The capsule (scale) diameter of 5.8 mm and the number of capsules per square metre (27,750) is the same for both variations. Every capsule combines four ring elements in a mesh grid of 6 mm to one unit. 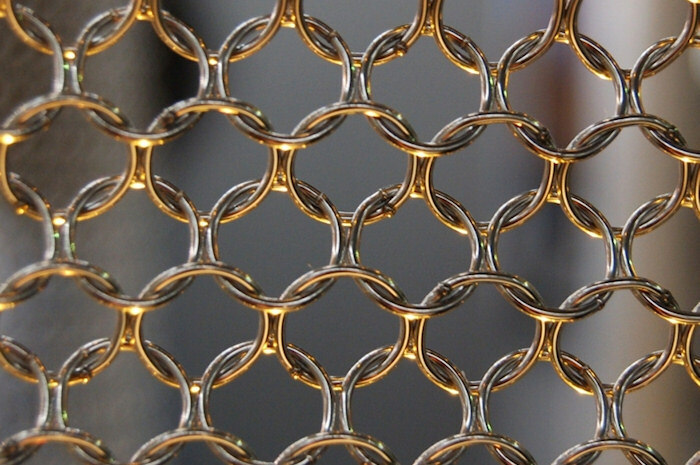 Naturally the weight per square metre of both scale meshes is different: here the brass scale weighs twice as many kilos as the mesh made of aluminium scales. Flexibility, lightness and the special structure of the mesh underscore the high measure of stand-along appearance. Alphamesh scale mesh is predestined for applications inside a building but this does not preclude application in outdoor areas. In order to be able to guarantee the valuable appearance and integrity of the scale mesh, the separate scrutiny of any outdoor application is advisable. 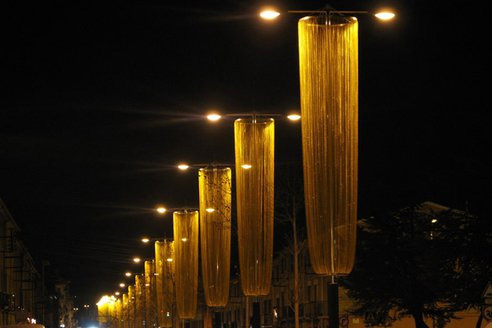 Another application of metal mesh in lighting reflections is a zero energy christmas decoration by Lavola that are lit due to the existing streetlamps. Lavola in Spain has designed some off-the-grid parasite lamps that are using the light from already existing street lamps to spark off the festive season. This parasiting kind of lighting, apart from its zero energy use, look good by night and by day, something that most christmas lights do not. This new christmas street decoration has a minimum impact on the environment and does not require energy, is durable and reusable as well as easy to assemble and disassemble. Some gold plated aluminum chains of adjustable sizes are attached to the existing street lamps to create the 3D shapes. The reflective material shines in the sun as well as when the street lights are on during the night. A LCA that compared this christmas lighting with a traditional one over a period of 15 years resulted in these lights having a 37% smaller impact on climate change. As previously reported, retroflexion is a very old invention of using a technology inspired by the cat’s eyes to increase the quantity of light and orient in the road-driving activity. The cat’s eye is a retroreflective safety device used in road marking and was the first of a range of raised pavement markers. It originated in the UK in 1933 and is today used all over the world. It consists (in its original form) of two pairs of reflective glass spheres set into a white rubber dome, mounted in a cast iron housing. The inventor of cat’s eyes was Percy Shaw of Boothtown, Halifax, West Yorkshire, England: the ispiration came from the eyeshine reflecting from the eyes of a cat. In 1934, he patented his invention (patent No. 436,290 and 457,536), and on 15 March 1935, founded Reflecting Roadstuds Limited in Halifax to manufacture the items. His invention consist of two glass beads placed close together was encased in rubber; this was then set in the road at intervals between the lanes of traffic. The device reflected the oncoming traffic’s headlights to show the way ahead. He then put a small depression where the beads are, which filled with water every time it rained. Any vehicles wheels passing over the device pressed the beads into the depression forcing the water out and thereby cleaning them. The Glass bead reflective technology is over 60 years old. In a glass bead reflective system, light strikes the back surface of the bead and returns to its source. 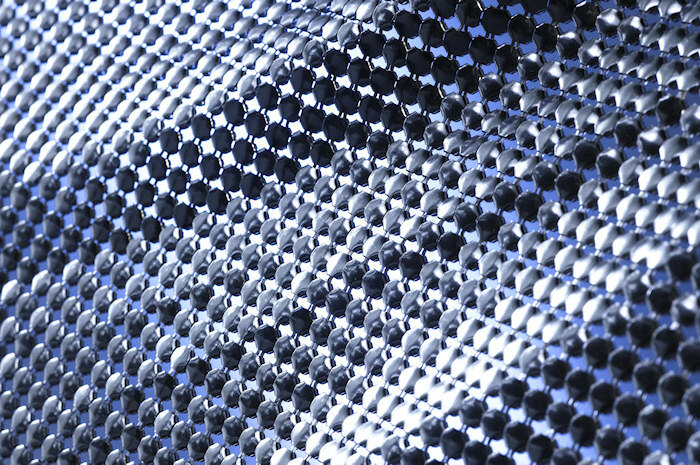 Glass bead technology differs from microprismatic technology in that reflective glass beads vary in size and placement, therefore creating inconsistency in the reflectivity. 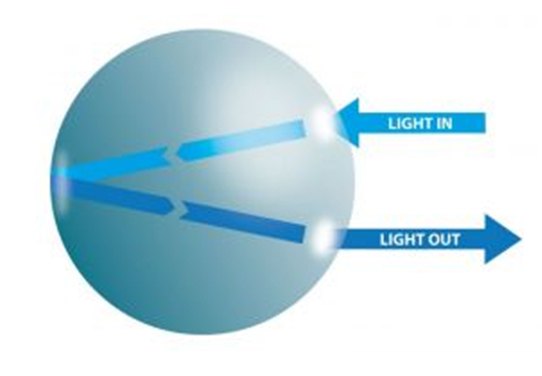 This technology returns light by as much as 30% unless affected by heavy rainfall that causes the reflective optics to scatter the light rather than reflect to the source causing blackouts of the reflective material until it dries again. Otherwise today we have products that use systems retroreflective microprismatic technology such as Reflexite Corporation. The microprismatic technology, discovered over 40 years ago, has proven to be the most optically efficient way of ensuring long distance visibility at dawn, dusk, in the work zone, on the roadway, at sea or in any environment where visibility is compromised. 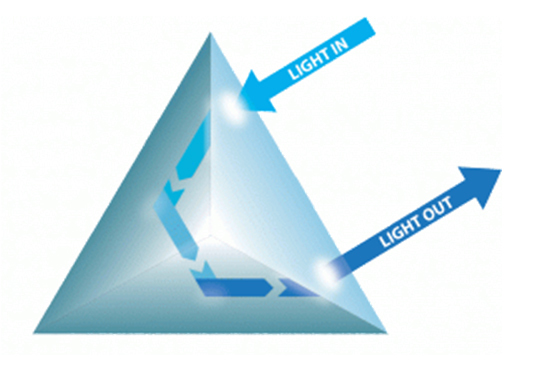 It works by refracting light from its inner surfaces: light strikes each of the three surfaces of the Reflexite microprism, before returning to its light source. The retroreflective efficiency is enhanced by the precise arrangement of the microprisms: the returned light from the original source is about the 80%, meaning enhanced visibility for the person or object. Another way to have retroreflective materials in a very minimum size is the nano cats eye’s in the product of Scotchlite by the 3M Company. Scotchlite is made of millions of glass beads (usually titanate glass) affixed to the surface. Each glass bead is covered with a metallic reflective layer on half of its surface (the “back” half) and this, combined with the spherical nature of the glass beads gives the materials their reflective properties. Scotchlite is designed to take advantage of the retroreflective optical properties of the glass beads, collecting light from a very wide range of angles of incidence and reflecting the collected light back along a single focused line of sight. When viewing the Scotchlite surface across this line of sight, the surface gives the appearance of reflecting far more light than a normal diffuse reflection. It is used for screens utilizing the front projection special effects process, as well as being employed for nighttime high-visibility safety applications on reflective clothing and on the front of many traffic signs. Scotchlite was invented in 1936.